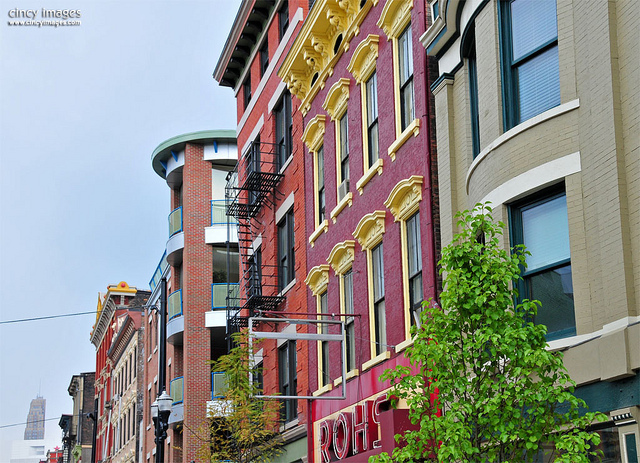 The influx of investment in Cincinnati’s historic Over-the-Rhine neighborhood has been profound over the past five years. Hundreds of millions of dollars have flowed into the neighborhood introducing new residential units, office and retail space. Much of that investment has come from the Cincinnati Center City Development Corporation (3CDC). To date, the development corporation has rehabilitated or stabilized 74 structures throughout the historic neighborhood, and so far the success has been unprecedented for the long-troubled neighborhood. Vine Street streetscape photograph by Jayson Gomes for Cincy Images. More than 77 percent of the 186 condominiums have been sold, 100 percent of the 68 apartment units have been leased, and 64 percent of the more than 91,000 square feet of commercial space has been leased. 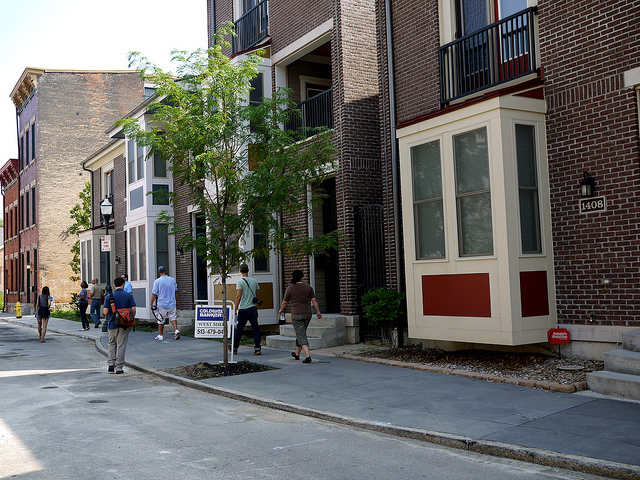 The work has primarily been focused in the southern portions of Over-the-Rhine along Vine Street and Main Street. Now development is shifting north and west as the success grows outward from the popular Gateway Quarter of Over-the-Rhine. In the coming month work will begin on the $51 million Mercer Commons development, the second phase of Parvis Lofts and seven other projects that will introduce 98 additional residential units and another 9,300 square feet of office space. Interesting to many is the fact that approximately half of them are located on Republic Street – the street where Cincinnati’s infamous race riots began in 2001. The street already boasts two sold-out condominium projects and has seen interest spike recently. Photograph of completed townhouses within the City Home development [LEFT] by 5chw4r7z. 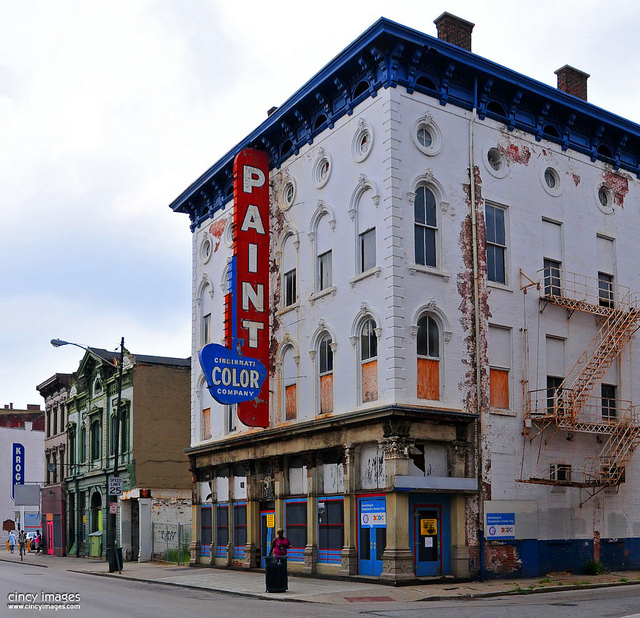 Photograph of Cincinnati Color Building, by Jayson Gomes, where work will soon begin [RIGHT]. While much of the work taking place includes building projects that are either constructing new buildings or restoring historic ones, one of the most notable projects is the $48 million restoration and two-acre expansion of Washington Park. Once complete, this project will include a new dog park, civic lawn, a performance stage, playground, splash park, historic bandstand and a 450-space underground parking garage. In all, 3CDC officials say that the amenities are meant to build upon the existing success and provide additional neighborhood assets for those currently living in the neighborhood. The large investments are not limited to 3CDC though. The $100 million renovation of Music Hall and the $95 million Cincinnati Streetcar both have neighborhood residents and business owners excited about even brighter prospects for Over-the-Rhine.